It's a question we've asked over and over: Walt Whitman subscribed. Do you? 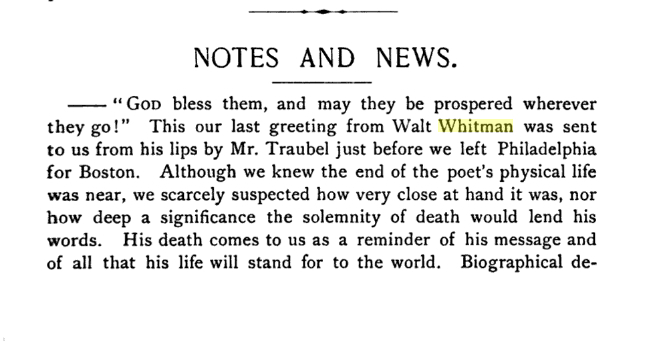 But today, on Whitman's 199th birthday, we remember that he not only subscribed to Poet Lore but engaged with us, too. In 1892, Whitman purchased ads for "Leaves of Grass" in three consecutive issues. When he passed later that year, our editors included a memorial message for the poet in the Notes and Notices section, highlighting his prior impact and predicting his lasting influence. "Inclusiveness was his point," an excerpt of the message reads. "For illimitable hope and love he stood and for that his style stood also; although it was strange, it was fit, and had a music all its own." Many years later, in our 107th volume, Poet Lore would feature a page from Whitman's notebook on the cover of our spring issue. In the accompanying Editor's Page, our editors would echo their forebearers sentiment, saying, "The [image of the notebook page] radiates conviction and expansiveness. 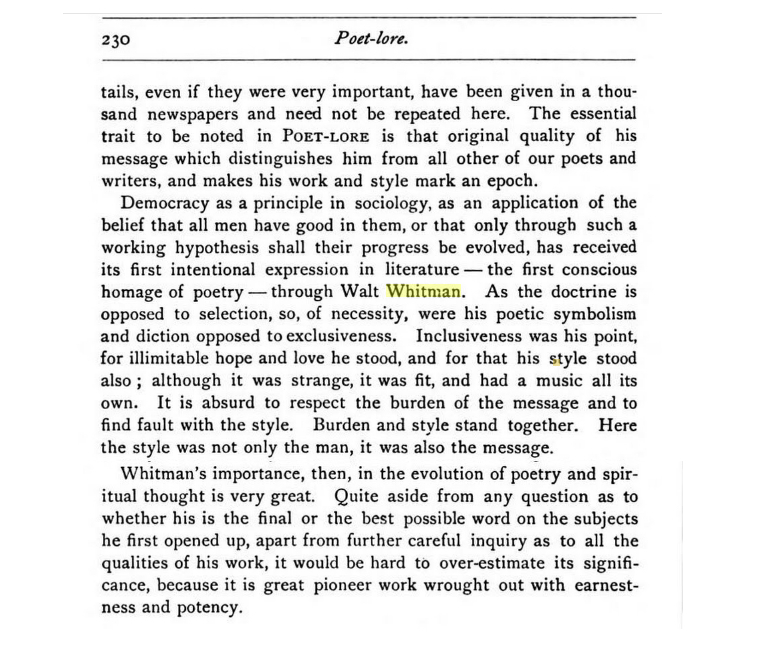 Who can fail to recognize Whitman in that?" Today in particular, though hopefully always, we remember Whitman by finding and crossing the blurred lines between expansion and inclusion. We try to cross those lines—extending ourselves only by fiercely embracing the world around us. Perhaps we try to recognize those elements of Whitman our Poet Lore editors have cherished for so many years—hope, love, evolution, style—not only in his own work but in that of our peers and ourselves. And if we find it hard to do so (or if we'd prefer a music all our own), there's still hope. 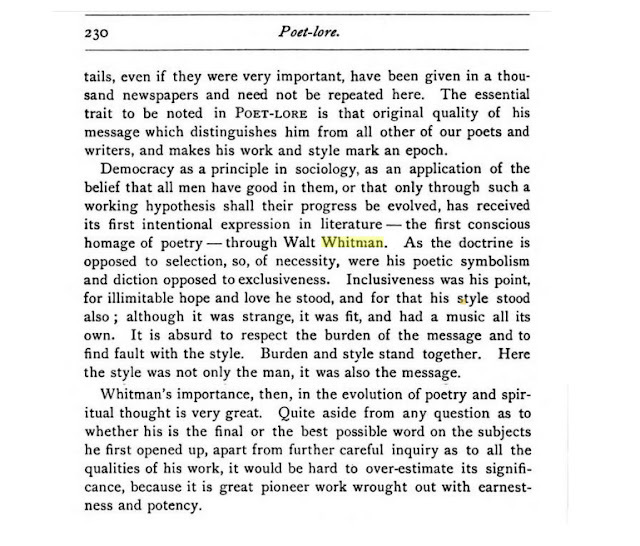 It's simple enough to follow in Whitman's prodigious footsteps...just subscribe to Poet Lore! 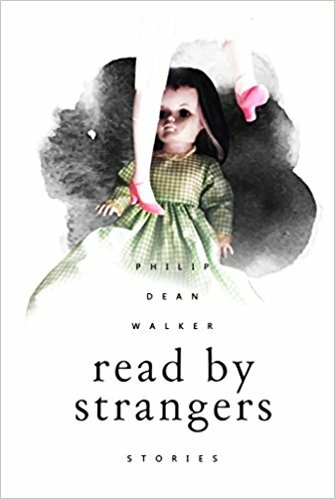 Philip Dean Walker was one of the first writers I met when I moved to this area. 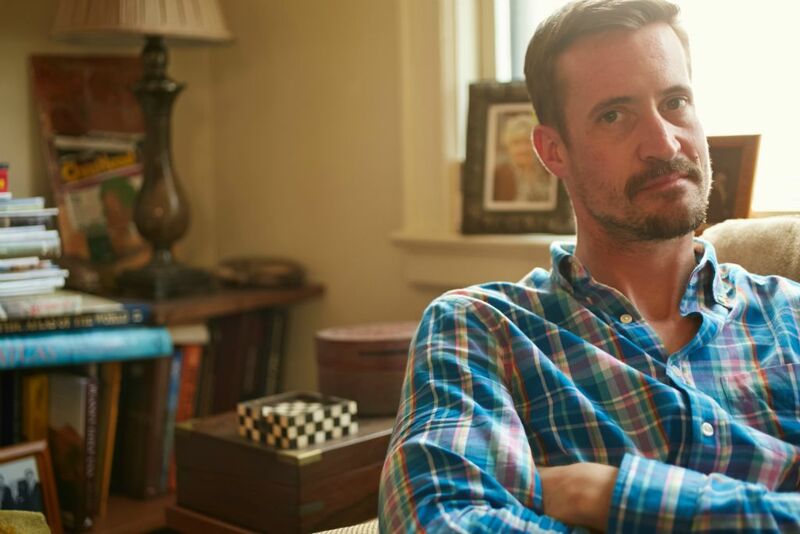 A native of Great Falls, Virginia, he received his MFA in Creative Writing from American University and now lives, works, and writes in Washington, DC. His first book, 2016’s At Danceteria and Other Stories, imagines the personal lives of 1980s-era celebrities as the AIDS epidemic simmers in the background. His follow-up story collection, Read by Strangers, was released last month. Phil was gracious enough to answer a few questions about his new work and what it’s like to be a working writer in Washington. 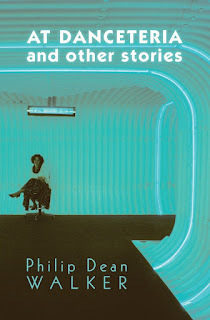 ZP: Your first book focused on a cultural moment, but Read by Strangers covers a lot more ground. What were the advantages and disadvantages of writing thematically linked stories? PDW: Before my first book was published, I always resisted writing a “linked” short story collection. It seemed like everyone in my MFA program was either writing one of them or working on a novel (which has always seemed equally daunting to me). My stories have always been, like, all over the place and were only ever linked by virtue of the fact that I was the one who wrote them. I never thought I would (or even could) write a linked collection. Then I stumbled upon the first story of At Danceteria and Other Stories. Then I wrote another, then another and another and another and then, all of a sudden, I had a thematically linked collection. So, never say never, I guess! The advantages of writing a linked collection is that you have a kind of blueprint for each new story. I had five elements that each story in Danceteria needed to hit in order to make it into the book so I had a rare road-map by which to travel (you just DO NOT really get those in the world of fiction). One disadvantage would be that lack of free range malleability one has in a collection that is more disparate (like Read by Strangers where I kind of “off-road” quite a bit with stories, characters, form, etc). This disadvantage can easily be made into an advantage though. I think it’s always a good idea to not let the reader get too comfortable. I wrote a story for Danceteria that veers off the path of the other stories, yet is also still of a certain theme (“The Boy Who Lived Next to the Boy Next Door”). It gave me some room to play around within my genre. This sounds super corny, but I love the power of turning a supposed negative into a positive. ZP: For me, the most striking aspect of your writing is your characters. They come alive on the page in even the simplest of interactions. Why is character so important to you and how do you develop it so well? PDW: Thank you for that compliment, Zach. It means a lot to me because I really love character. The only thing I love more in writing is probably the language itself. Characters drive story. When characters do something on the page, they are moving the momentum of the narrative (this seems obvious but it actually needs to be stated outright sometimes). I spend a lot of time with a character before I even put a single word down on the page which might be why they seem more “alive.” I love flawed people mainly because they provide so much material for story. I love to think of the things they would say – dialogue has become really important to me in the past couple of years, it just has to be believable or your reader will check right out. I might have spent too much time worrying about the characters in Read by Strangers and how readers would respond to them. Many of them are, to put it plainly, not good people. Some of them make horrible choices and do bad things. But I don’t think people want to read about nice, boring people doing nothing. If someone walks away remembering a single detail about a character, weeks or even months after reading a story, it’s a success to me. I think one of the most important skills a writer can possess is empathy. A good writer must have it and must be able to summon it to deal with all kinds of characters. I think that’s one of the key ingredients to making them seem real. I mean, who was the last sociopath you know who put out a good novel or short story? ZP: You also write about place beautifully. How has living in Washington influenced your writing? PDW: Living in Washington has given me an appreciation for all kinds of people and all kinds of stories. And story can be located anywhere—at a big weekend brunch, at a party, on the other side of town in a neighborhood you've always driven past but never ventured into. I was speaking about setting and place with another writer and I told her that setting should never overwhelm a story (unless the setting or place is essentially acting as a character in the story similar to what I do in Strangers’ “Unicorn”). There are a couple stories in my new collection that take place in Washington, DC, or the surrounding environs, but it’s really just lightly suggested. Place is as important to a story as a writer chooses to make it. My stories that take place in Tokyo are very much connected to that setting, so “place” has a more vital function in those pieces. ZP: Finally, what’s one piece of advice you have for aspiring writers? PDW: This is a great question, Zach. My biggest piece of advice is this: if you’re afraid of writing it, you must write it. Simple but true. 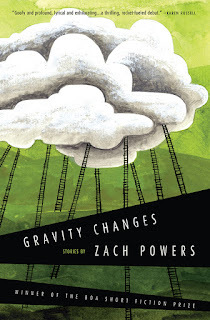 Chances are you’ve already seen some of Zach Powers’s work in one of our emails or on Facebook and Twitter. He started helping us out at The Writer’s Center at the beginning of the year and came on full-time this month. Zach is a seasoned media specialist with 15 years of experience, including many years working with nonprofits. 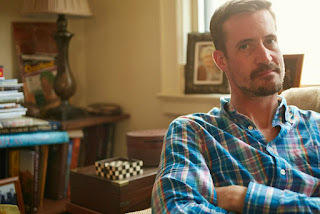 He’s also an accomplished author of literary fiction, including an award-winning short story collection (Gravity Changes, BOA Editions, 2017) and a novel, First Cosmic Velocity, forthcoming from Putnam/Penguin. 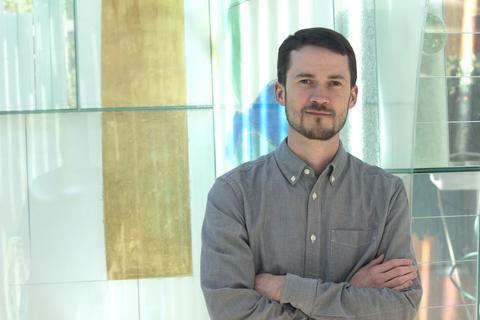 We asked Zach a few questions so he could introduce himself to The Writer’s Center family. TWC: We’re all writers here, so let’s start with that. Can you tell us a little about what you write? TWC: You didn’t start out in either in writing or media. How did you end up at this point? ZP: I actually studied music in college. After graduating with no practical job skills, I took an entry-level position at a TV station in my hometown, Savannah, Georgia. I worked my way up from there, and stayed in TV for nearly a decade. I started writing seriously on the side, and eventually got my MFA and started publishing. I was a little disappointed in the writing community in Savannah, so I co-founded a literary arts nonprofit called Seersucker Live. The organization hosted readings and events, featuring well over a hundred national, regional, and local authors. I also led the writers’ workshop at the Flannery O’Connor Childhood Home, where I served on the board of directors. I was looking for a similar literary community when I moved to the DC area, and that’s how I ended up here at The Writer’s Center. TWC: What other nonprofits have you worked with? ZP: After I left the television industry, I worked at Savannah’s Telfair Museums, the oldest public art museum in the South. I was the digital communications coordinator, and worked in a small marketing department. I love visual art, and it was great to be behind the scenes, helping exhibitions come together. I also served as a volunteer with Deep Center, teaching creative writing to middle and high school students. TWC: You’ve also taught college writing, correct? ZP: That’s right! I taught composition and creative writing at University of South Carolina Beaufort, and I currently teach classes at Northern Virginia Community College. I like sharing my love of writing with students. That’s one of the reasons it’s been so exciting working at The Writer’s Center. I’m also looking forward to becoming more involved with the DC literary community, and I know The Writer’s Center puts me right in the middle of things. You can learn more about Zach and his writing at ZachPowers.com. Quality or Quantity: Which is More Important For a Writer? If you’re busy turning out bestsellers, quantity is the answer, right? But if you want to write a literary masterpiece, then quality is more important. Well, not exactly. These two writerly desires for most of us are inseparably linked, and here is why. To remind myself of all this, I promised a group of writers to finish a piece of creative writing every day in May 2018. We email our finished pieces to about six other committed souls before midnight each day. We do that without giving or receiving feedback. Every day there’s a feeling of having done what one was meant to do. It’s also a reaffirmation of what is important to people like us—actually doing the writing! Though we may have to trick ourselves to do what our whole hearts want to do, the next step in the process—sending it out for publication—may also require some sleight of hand. LitHub author Kim Liao wrote recently about setting a high rejection goal. If you aim for say 100 rejections this year, you will have to send things out. In the process, you’ll up your acceptance rate and remove some of the sting of rejection, because, after all, isn’t rejection what you’re aiming for? “Ok, ok,” you may be saying, “but I want to write really well, if I’m writing a lot.” The Writer’s Center has plenty of workshops to help you do just that—but here is something especially for poets that you might want to look into. I will be teaching 3 Poems in 4 Days, June 4, 5, 6 and 7, 2018 in TWC’s temporary home. In this workshop, you will find that it is possible for you to write both often and well.